Everyday Use Wrist Covers / Arm Sleeves. Please choose amongst 12 colors shown above in this listing. Decorative element design at wrist may be slightly different from stock photo shown to the right, this depends on daily inventory. Made using man-made fibers such as polyester, polyamides, and /or nylons. This is not made from cotton. I love these. Now I can wear 3/4 sleeved shirts without wearing a complete under shirt. This is a great product. These are very comfortable (stretchy, not itchy) and come in so many colours - love it! Great color selection, fit well and are cool. I like them very much! Maa Shaa Allaah - these are very comfy, stylish, long enough for long arms (tall people like myself), easy to remove for wudu, etc. 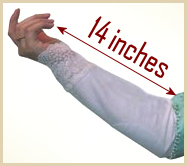 Ordered arm sleeves in several colors. Love how I can wear shorter length sleeves and still be covered. Stretchy and comfortable also. these are neat and very comfortable. Easy to cover up in a wide variety of colors. Click the button below to add the Wrist Covers, Arm Sleeve Covers to your wish list.